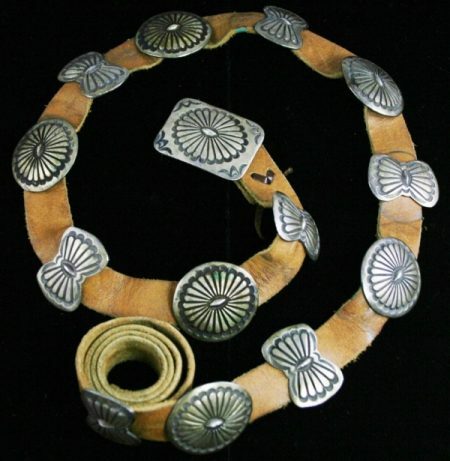 This beautiful concho belt was created from labor intensive hand rolled and hammered ingot sterling silver by Calvin Martinez in the early 1980s. 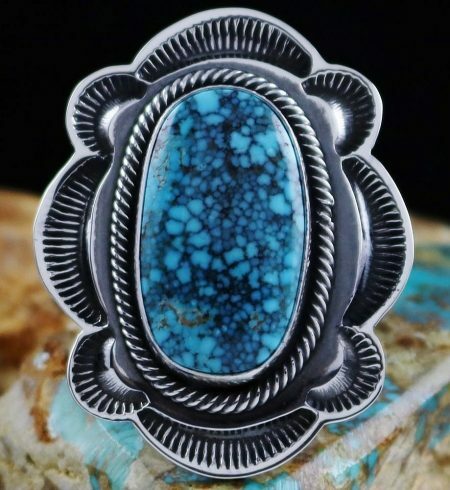 He has rolled each concho and deeply stamped them in his signature style. 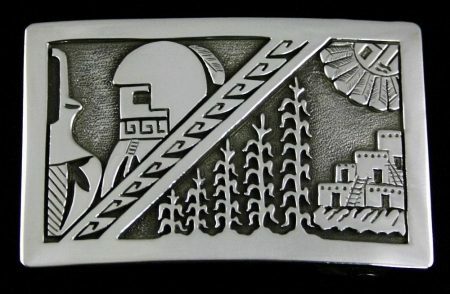 The buckle is square to set off the design in contrast to the ovals and butterflies used in the rest of the belt. Designed for wear with jeans, the belt fits easily through belt loops. All of Calvin's concho belts are highly collectible. 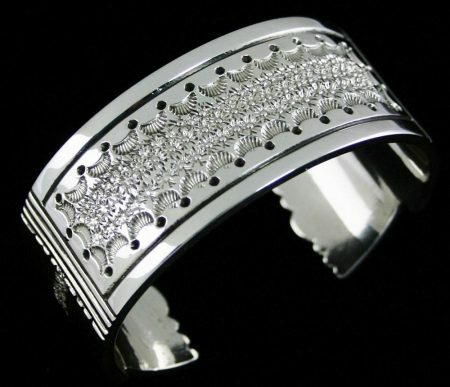 He has been a pioneer in the revival of traditional sterling silver ingot jewelry. Created out of heavy gauge sterling silver, the fine shank of this bracelet is precisely hand split and chiseled to create the design. It is then deeply stamped in the Morgan tradition, perfect and striking. 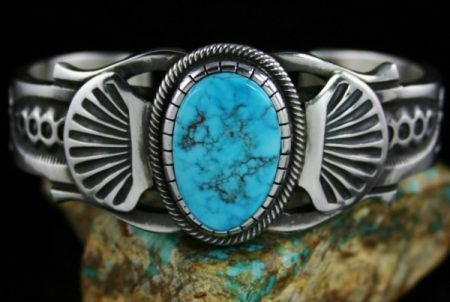 Jacob has selected a rare and beautiful gem grade natural Godber Burnham turquoise to set in unique hand made bezel that wraps around the stone along with thick braided wire. The cabochon is sky blue with complex black spiderweb matrix. Godber Burnham gems are rare and seldom encountered. The mine is one of the classics from Nevada and stones of this quality are highly sought after. The bracelet is stunning on the wrist, beautiful and perfect for everyday wear or that special occasion. These beautiful earrings were made by Terry in his meticulous and labor intensive way. 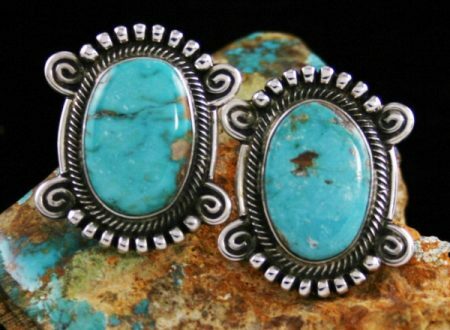 Two lovely natural Easter Blue turquoise cabochons are set in hand made bezels and surrounded in twist wire. Deep chisel work appears at each end next to his distinctive coils of silver work. The finished earrings are striking on the ear, perfect for that special occasion. 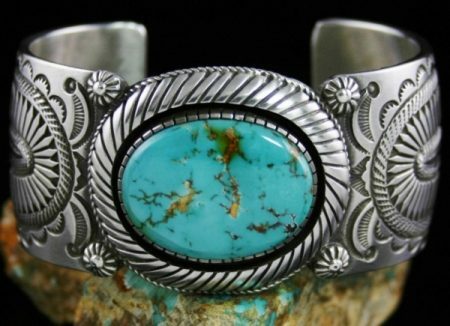 This stunning bracelet is a fine example of one of today's most creative Native American jewelers who works in sterling silver ingot. The large gem grade natural Easter Blue cabochon at the center is held in a hand chiseled bezel encircled with an incredibly unique shadowbox and rope stamping with four large stars on the outer edges. 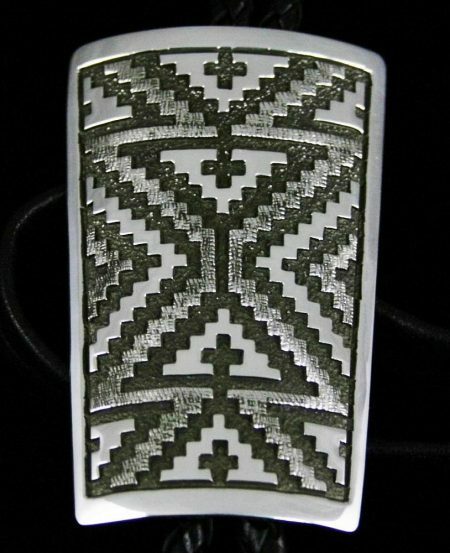 Navajo jeweler Calvin Martinez finishes the design with two deeply stamped faux conchos on each side. The completed bracelet is one of a kind and highly collectible. Rolled and hammered sterling silver ingot silverwork as well as deep stamping with home made tools is Terry's specialty. This beautiful large cross is a fine example of his creativity. 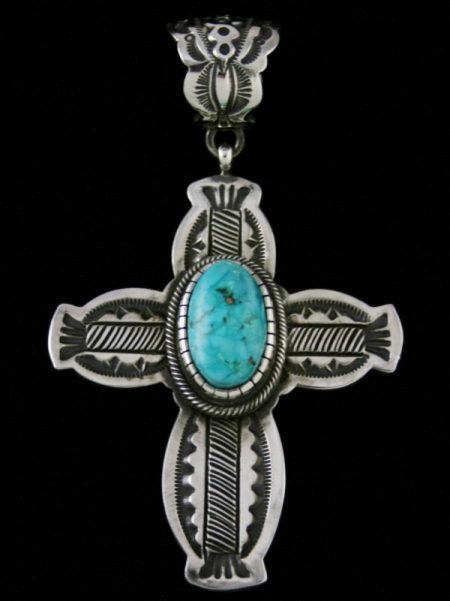 A rare high grade natural Morenci turquoise is surrounded in twist wire in the center of the cross. It is attached to a large bail with intricate and deep stamping. The cross is a perfect gift for the holiday season. A large and gorgeous gem grade natural Royston turquoise sits in a fine hand chiseled bezel to highlight this great pendant. The gem is hunter green with eye dazzling gold spiderweb matrix. 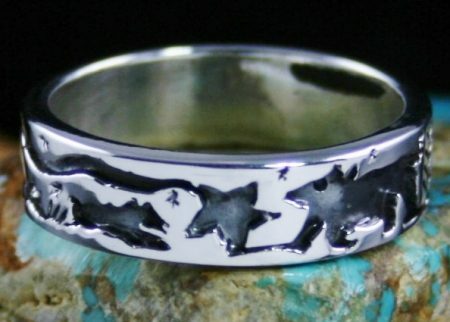 Terry has created the outer edges out of precisely hand pulled and coiled ingot wire with seven large stars at the bottom. A beautiful thunderbird is displayed at the top. The pendant attaches to a large bale deeply stamped to perfection. The size of the bale is ideal for a large necklace or hand made beads. 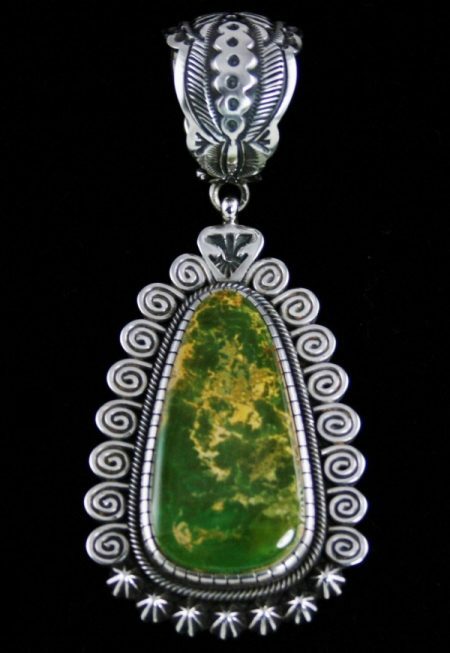 Terry's pendants are unique and beautiful as well as highly collectible. 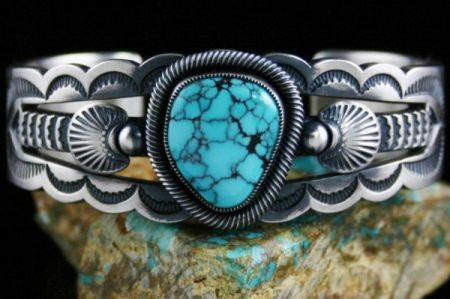 Created by Navajo jeweler, Terry Martinez, this spectacular ingot bracelet features a gorgeous and impressive high grade natural Morenci turquoise cabochon. The gem is sky blue with flecks of silvery pyrite matrix that glistens in the light. An intricate hand chiseled bezel encircles the stone accompanied by thick hand braided wire. Large crescent shaped overlay patterns are displayed on either side of the ingot sterling silver bracelet shank that is deeply stamped in Terry's signature style. 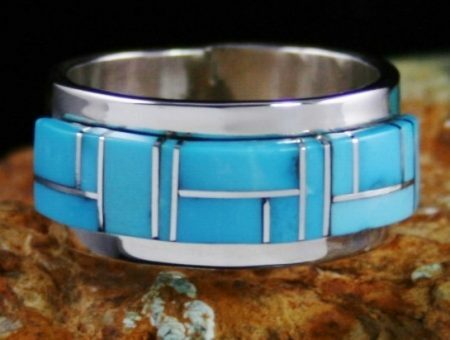 The piece is finished with a unique central pattern that flares out on the outer edges of the center of the band complimenting the quality of the stone to perfection. 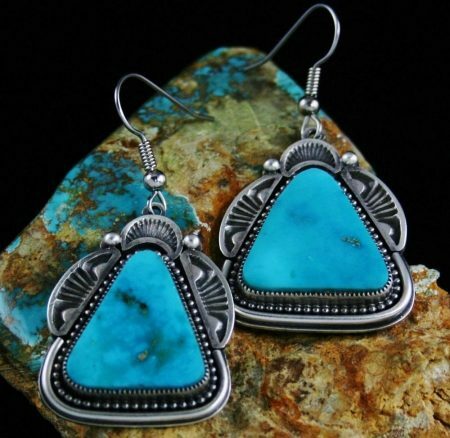 These exciting earrings by Terry Martinez feature two lovely high grade natural Blue Gem turquoise cabochons. The gems are a beautiful deep blue with golden and chocolate matrix accents. They sit in hand made bezels surrounded in twist wire. 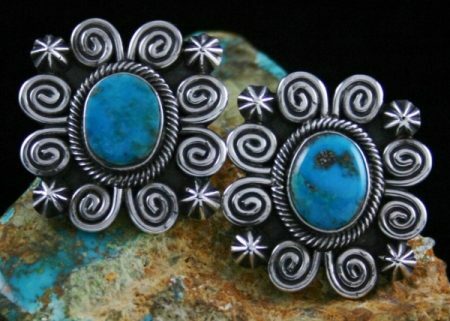 Elaborate coils of silver work encircle the stones and are separated with four hand made stars on the outer edges. The earrings are a gorgeous and striking statement on the ear. 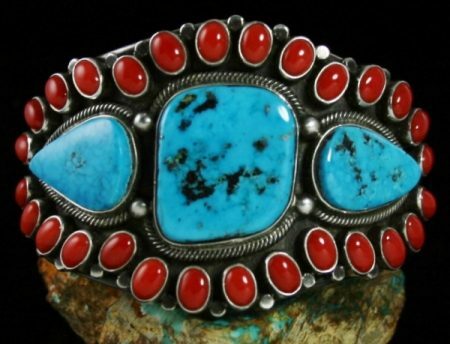 Three spectacular large gem grade Morenci turquoise cabochons were chosen by Navajo jeweler Terry Martinez to feature in this spectacular bracelet. The natural gems are sky blue with black and pyrite host rock matrix that glistens in the light. They sit in hand made bezels surrounded in twist wire with smooth droplets in the center. Twenty eight gem grade natural Mediterranean coral cabochons create the edge of the bracelet. These corals from a private collection are seldom seen on today's market. Flawless, they are deep oxblood red, perfectly matched and of the finest quality. 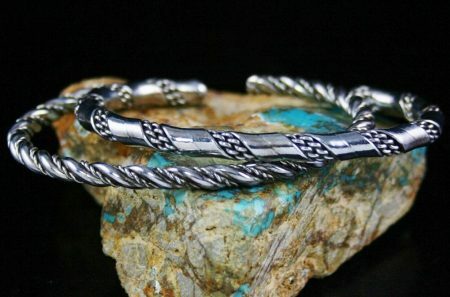 The shank of this fine bracelet is made of heavy wire pulled by hand and twisted into shape. 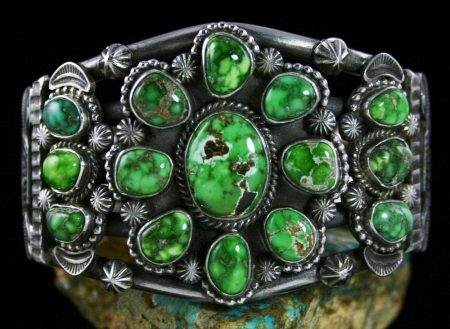 The bracelet is gorgeous, unusual and highly collectible. 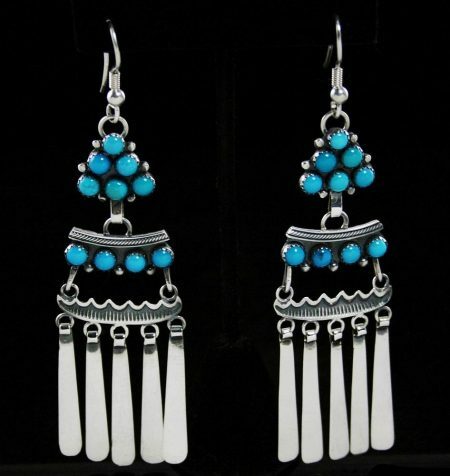 Two matching high grade natural Blue Gem turquoise cabochons were selected to create these lovely earrings by Navajo artist Terry Martinez. The gems are sky blue with delicate water web matrix. They are set in hand made bezels surrounded in twist wire. The outer edges of the earrings are set off with swirls of larger smooth twist wire and sterling silver balls. 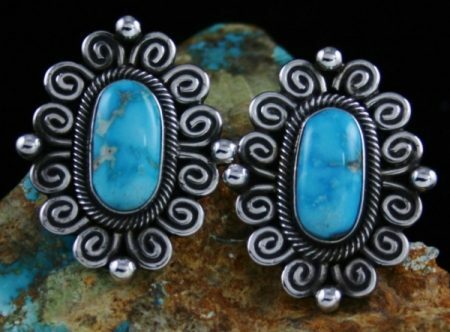 Beautiful and elegant, they make an impressive statement when worn on the ears.